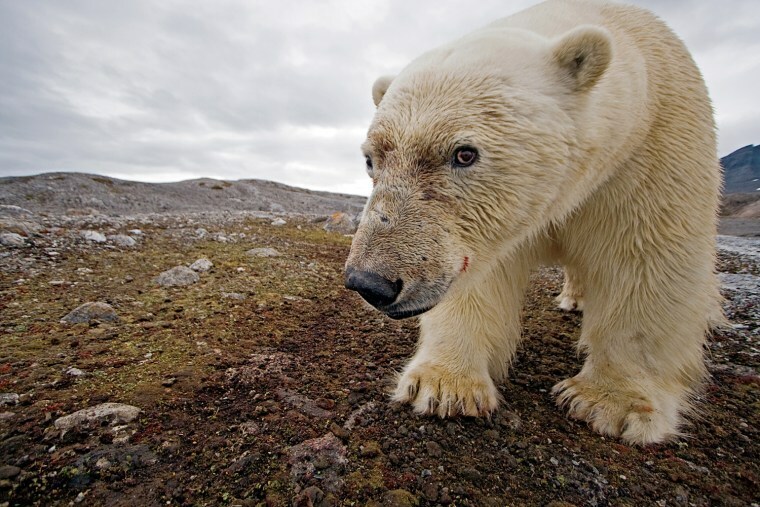 National Geographic photographer Paul Nicklen captures images of life in the polar reaches and the effects of climate change. In his book "Polar Obsession," National Geographic photographer and biologist Paul Nicklen captures images of life in the polar reaches, as animals struggle with the effects of climate change that threaten their existence. The polar regions have warmed at least five times as much as the rest of the planet over the past 100 years, and warming is causing the ice to disappear at an alarming rate. 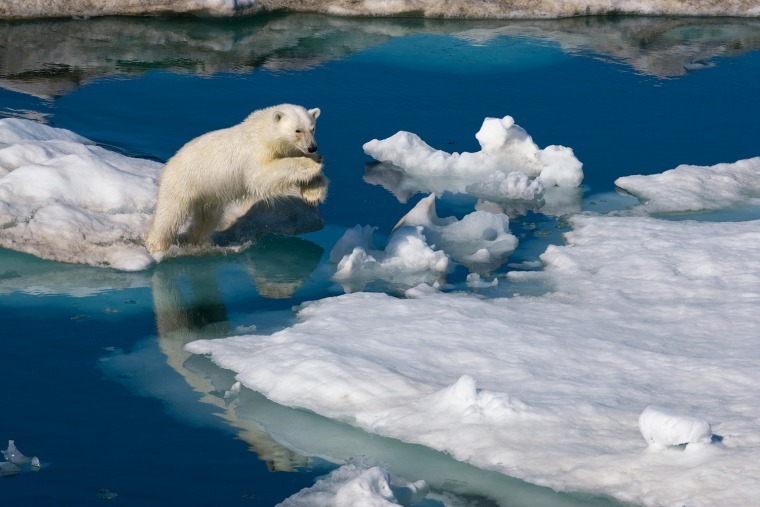 In this photo, a young polar bear leaps between ice floes in the Barents Sea in Svalbard, Norway. 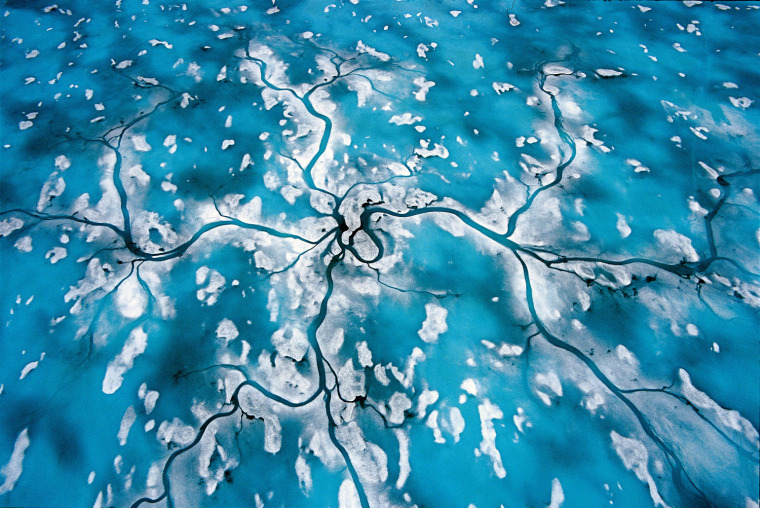 In the Arctic spring, meltwater channels drain toward and down a seal hole, returning to the sea. White ice or snow reflects over 90 percent of the sun's energy back into space. As the snow melts from the surface, it reveals the much darker color of blue sea ice, which can then absorb up to 90 percent of the sun's energy, accelerating the melting process. 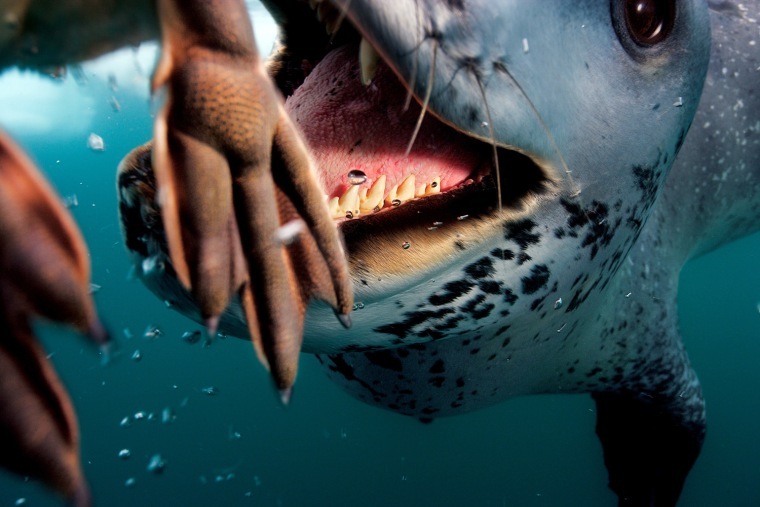 A leopard seal is about to feed on a penguin in the Antarctic Peninsula. 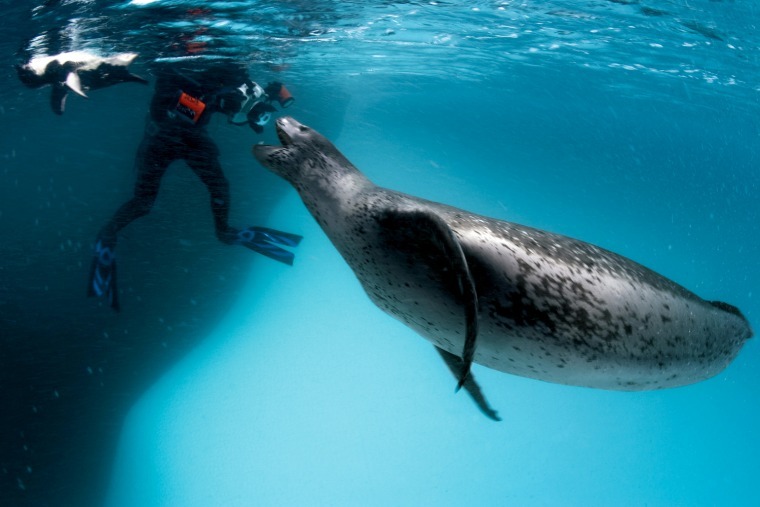 "Tragically, in 2003, Kristy Brown, a scientist wih the British Antarctic Survey, was snorkeling during the Antarctic winter and was pulled under and drowned by a leopard seal," Nicklen writes. "Investigators surmised that the seal may have been starving as a result of being trapped inland for the winter, rather than out in the open ocean." 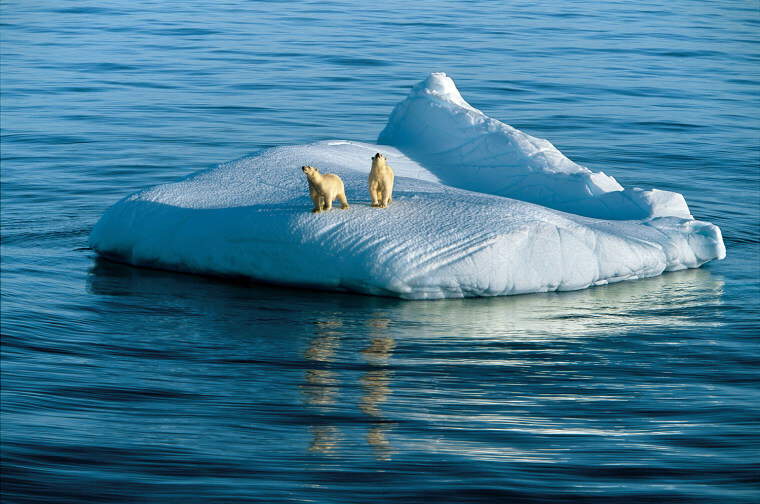 A mother bear and her 2-year-old cub drift on glacier ice in the Hudson Strait, Nunavut, Canada. Although polar bears are powerful swimmers, they need sea ice, which serves as a platform for them to hunt for ringed seal, their main prey. In many places in the Arctic, the sea ice breaks up and melts earlier each spring and freezes later each fall, forcing bears to remain longer on land without food. 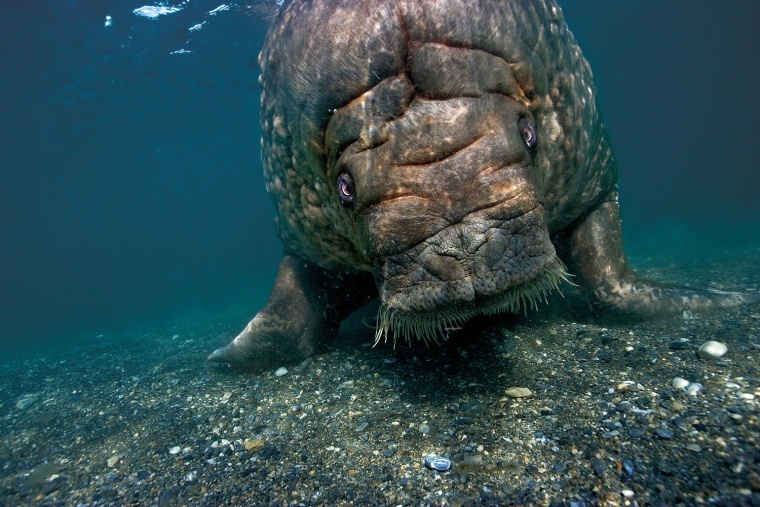 A large bull walrus returns to the shores of Prins Karl Forland after diving and feeding on clams in Svalbard, Norway. 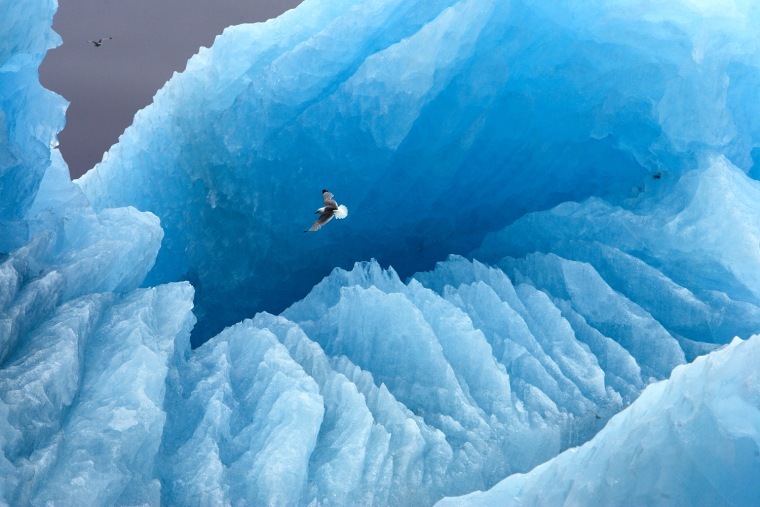 A kittiwake (a type of seabird) soars in front of a large iceberg in Svalbard, Norway. 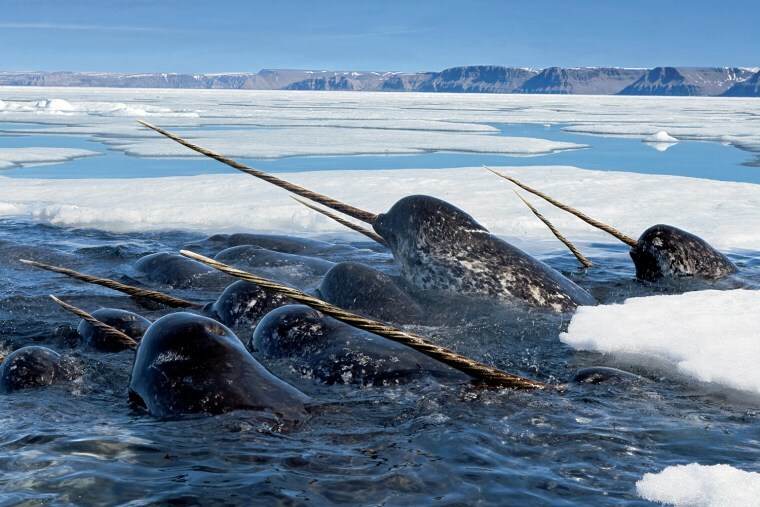 Narwhals, a type of toothed whale, dive deep under the ice to feed on Arctic cod, then return to the surface to breathe and raise their tusks high in the air in Lancaster Sound, Nunavut, Canada. "These clever, sensitive animals, which live in a polar sea with up to 97 percent ice cover, can hide nearly their whole lives," writes Nicklen. 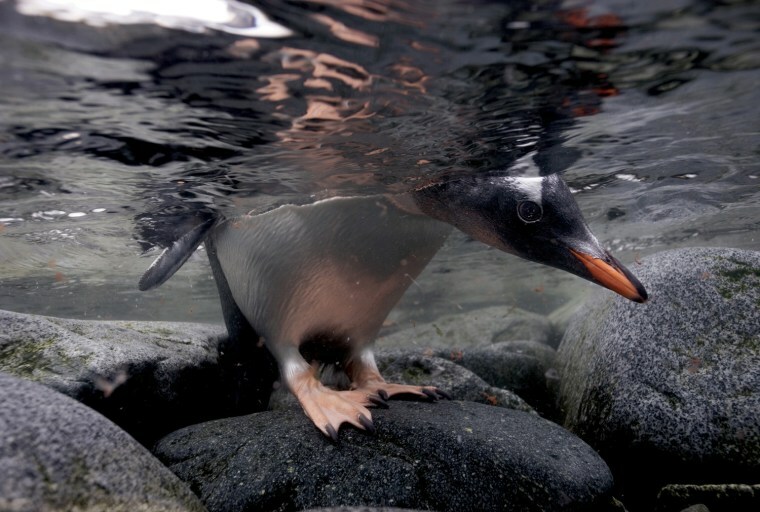 A gentoo penguin chick in Port Lockroy, a natural harbor on the Antarctic Peninsula, peeks underwater, checking for patrolling leopard seals. A large female leopard seal greets photographer Göran Ehlmé in Anvers Island, Antarctica. 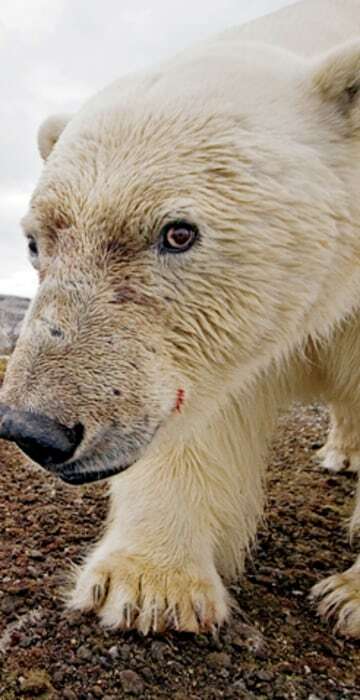 Looking toward an uncertain future, a huge male bear triggers a camera trap, unwittingly taking his own picture in Spitsbergen, Norway. 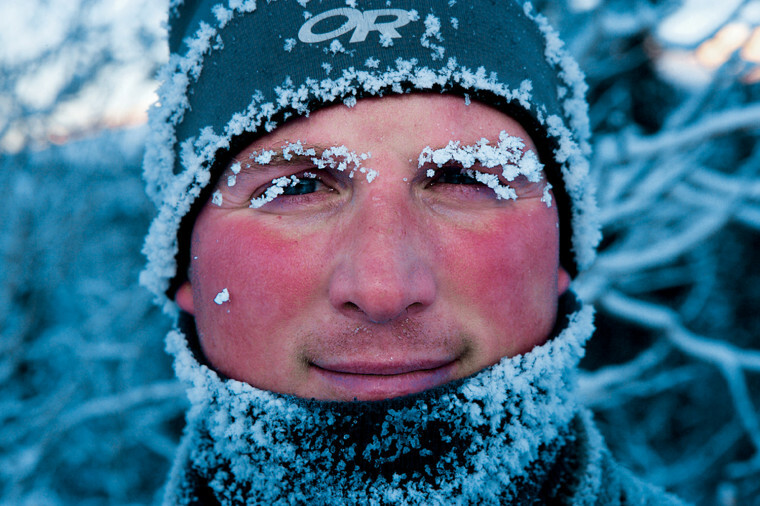 Photographer Paul Nicklen stands snow-crusted and ruddy-faced on assignment in Lewes Lake, Yukon Territory, Canada.